Although e-files can be invaluable tools for nail techs, they can be dangerous if misused. That means proper training is crucial, according to North American School of Podology president Vicki Malo, who recommends techs start by getting advanced training. Here are some of Malo’s top tips for using e-files in pedicures. Anchor the e-file. Anchoring the e-file properly means that if a client involuntarily moves her foot, the nail tech will remain in control, avoiding the risk of injury. To anchor, hold an e-file like a pencil, with the thumb underneath and index and middle fingers supporting it. “Take your pinky finger and anchor to the client’s foot, maybe underneath the toe if you were working on the toe,” explains Malo. “You need to hang onto the toe you’re working on with the other hand with a nice firm grip, because if you don’t hold onto it, it may vibrate and be uncomfortable for the client.” When working on the bottom of the foot, Malo suggests holding the file with the hand palm up and placing the e-file across your four fingers. Wrap your fingers around the file, then anchor your thumb to the bottom of the foot and gently roll the file toward your thumb. Don’t be too heavy-handed. 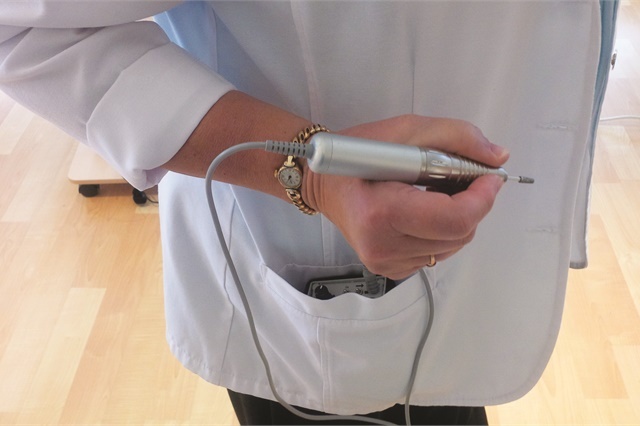 Nail techs should not push too hard with the e-file — when used properly, no additional pressure should be needed. “The bit and the e-file do the job, not your pressure,” explains Malo. “You never want to be pushing hard or losing control.” It’s also important to use the correct RPM for the task. “If you’re doing callus removal with a larger bit on the bottom of the foot, you’d want a slower RPM than if you were reducing a thick toenail,” says Malo. Keep conditions safe. Techs should tie back long hair and wear properly fitted gloves so the finger of the glove doesn’t hang and get caught. Proper ventilation is also important, and techs should make sure to use an e-file with vacuum suction or wear a mask. The e-file must be regularly disinfected, as well.